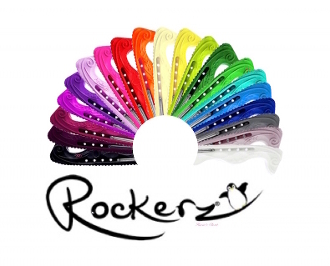 Rockerz Figure Skate Blade Guards are a fun and colorful way to rock through your walk! Patented curved bottom is designed to reduce impact and increase mobility. Click on images for color selection and for help determining blade make and model. DO NOT PUT IN YOUR SKATE SIZE! WE CAN'T DETERMINE YOUR BLADE SIZE FROM YOUR SKATE SIZE. If you do not know your blade size, please click on images which instructs you how to determine your blade size!!!! Accommodates all figure blade models. Sleek, unique waves provide lateral support. Beveled thumb grips for easy handling. Heavy-duty tread for safety and security. Wider more stable base for comfort and safety. Custom-cut to your blade model and size. Patented V-shape channel, easily guides blade in place. Fully-recessed springs and screws for easy handling. Made in the USA with highest quality and eco-friendly standards. Green product, made with recycled materials and 100 percent recyclable parts. Please note: Once guards have been cut they can not be returned! Please make sure you have entered the correct make, model and size before confirming your order!! Please click on image for reference.